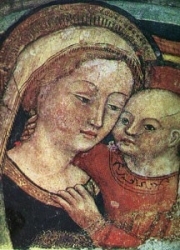 Records dating from the reign of Paul II relate that the picture of Our Lady, at first called La Madonna del Paradiso and now better known as Madonna del Buon Consiglio, appeared at Genazzano, Italy, a town about twenty-five miles southeast of Rome, on 25 April 1467, in the old church of Santa Maria, which had been under the care of Augustinians since 1356. The venerated icon itself, which is drawn on a thin scale of wall-plaster little thicker than a visiting-card, was observed to hang suspended in the air without support; early tradition says that one could pass a thread around the image without touching it. Devotion to Our Lady in Santa Maria sprang up at once. Pilgrims began to pour in, miracles began and continue at the shrine. In July 1467, Pope Paul deputed two bishops to investigate the alleged wonder-working image; no copy of their report is known to have survived. Devotion to Our Lady increased. In 1630, Pope Urban VIII made a pilgrimage to Genazzano, as did Pope Blessed Pius IX in 1864. On 17 November 1682 Pope Blessed Innocent XI had the picture crowned with gold by the Vatican Basilica. In 1727 Pope Benedict XIII granted the clergy of Genazzano an Office and Mass of Our Lady for 25 April, the anniversary of the apparition, elsewhere the feast being kept a day later so as not to conflict with that of Saint Mark the Evangelist. On 2 July 1753 Pope Benedict XIV approved the Pious Union of Our Lady of Good Counsel for the faithful at large, and himself enrolled therein as its pioneer member; Pope Pius IX and Pope Leo XIII were both later members. On 18 December 1779, Pope Pius VI, while re-approving devotion to Our Lady, granted all Augustinians an Office with hymns, lessons, prayer and Mass proper of double-major rite; with a plenary indulgence also for the faithful, to which Pope Pius VIII added another for visitors to the shrine. On 18 December 1884, Pope Leo XIII approved of a new Office and Mass of second-class rite for all Augustinians, while on 17 March 1903, he elevated the church of Santa Maria - one of the four parish churches in tiny Genazzano - to the rank of minor basilica. On 22 April 1903 he authorized the insertion in the Litany of Loreto of the invocation Mater Boni Consillii to follow that of Mater Admirabilis. The same pontiff on 21 December 1893 had sanctioned the use of the White Scapular of Our Lady of Good Counsel for the faithful. Born a pagan. As a young man he protected Cadoc and Frichor, Irish missionaries in danger from local non-Christians. While in hiding, the missionaries converted Richardius. He became a priest, travelling the country on a donkey and preaching the Gospel. 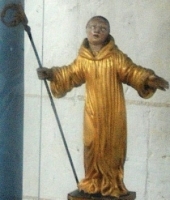 Worked in England for several years, then returned to France to found an abbey at Centula and serve as its first abbot. When King Dagobert visited him, Richarius was so frank and blunt with his advice that the king gave him a large reward; Richarius passed it on to the poor. He was among the first to work on ransoming captives. Eventually resigned all offices to live his final years as a prayerful hermit. An artistic young man, he studied architecture in Madrid, Spain. 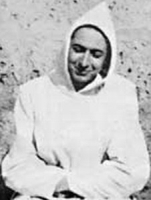 However, he felt a call to the religious life, and on 15 April 1934 Rafael became an oblate friar of the Order of Cistercians of the Strict Observance (Trappist). Suffered from acute diabetes, a condition that forced him to leave the monastery three times, but each time, as soon as he was sufficiently healed, he returned to the monastic life. One of nine children born to Francis and Frances Kubista. Served in the army on the French front from 1917 to 1919. Member of the Society of Divine Word, making his perpetual vows on 29 September 1926. Ordained on 26 May 1927. Middle school teacher. Novice master and spiritual director. Built and ran a printing press, edited and published Little Missionary, Little Missionary Calendar, Calendar of the Word of God, Messenger of Saint Joseph and other works. Arrested on 27 October 1939 by Nazis, transferred from prison to prison until he arrived at the Sachsenhausen concentration camp. Martyr. Convert, brought to the faith by Saint Peter the Apostle, who ordained him. Third pope. He ordained an undetermined number of priests during his reign, but almost nothing else is known about him. Martyred in the persecutions of Domitian. May have been the Cletus that Saint Augustine of Hippo wrote about. 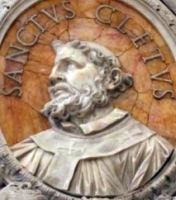 He is mentioned in the Canon of the Mass. Salesian, making his profession in 1912. Ordained in 1921. Taught philosophy, literature and Gregory chant in Girona, Spain, and served as spiritual director to other Salesians. Arrested by anti-Catholic forces in 1938, but was released. Helped some other Salesians escape across the border, which led to Father Juli's re-arrest for treason and espionage. Martyred in the Spanish Civil War. Chosen 29th pope. Enlarged the catacombs. Reigned at the start of the persecution of Diocletian, and was himself martyred. Legend says that he apostatized, made sacrifice to pagan gods, then repented, and was beheaded, but this story has been discredited. Abbot. Following a pilgrimage to Rome, he became a missionary hermit at Münstertal, Germany. Legend says that some workers, paid by a local lord to clear difficult land to establish a foundation for Trudpert, were fed up with the hard work and killed Trudpert to end the job. Considered a martyr. Spanish Dominican. With Blessed Gregory, he preached in the villages of the Somontano, near Barbastro, near the Spanish Pyrenees. While travelling from one village to another, they were caught in strong thunderstorm; they sought refuge under and overhanging rock, which was loosened by the rain, and fell on them. Spanish Dominican. 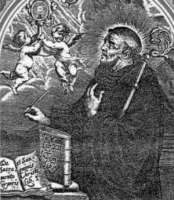 With Saint Dominic, he preached in the villages of the Somontano, near Barbastro, near the Spanish Pyrenees. While travelling from one village to another, they were caught in strong thunderstorm; they sought refuge under and overhanging rock, which was loosened by the rain, and fell on them. Ordained on 18 December 1920. Auxiliary bishop of Lublin, Poland and titular bishop of Meloë in Isauria on 10 August 1938. Deported by Nazis from occupied Poland to the Sachsenhausen concentration camp. Martyr. Married lay woman. Widow. Tertiary of the Holy Humility of Mary. She devoted her life to personal penance and charity to the poor, was given to religious ecstasies, and received visions. Greatly honoured in Siena, Italy. Bishop of Amasea in Pontus. 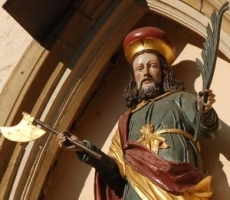 When he was killed in the Licinius persecutions by being thrown into the sea to drown, one of his disciples was directed to his body by an angel so it could be recovered and given Christian burial. Nun. Her relics are venerated in Troyes, France. Martyred in the persecutions of Diocletian. 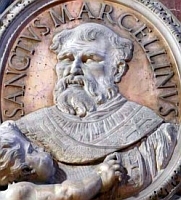 Mentioned in the Acts of Saint Marcellinus, Pope and Martyr. Fourth century bishop of Verona, Italy. Famous for a life of prayer and study.